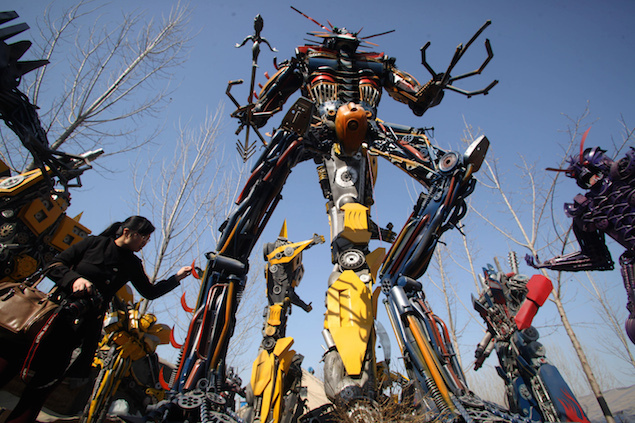 A group of farmers have brought to life the “Transformers” films, toys and TV series and built giant robots out of old car parts, in rural China. The original toys, which were a huge hit with children in the 1980s, could be turned from cars into robots and back again. Their popularity spawned a hit television show, and more recently, the movie franchise. In Shandong province, they have inspired a range of towering creations, including some in the red and blue colours of Optimus Prime, the leader of the benevolent Autobots. Others are in bright yellow – like the famous Bumblebee character adored by young fans. Some of the robots are crafted from the grey metal of the evil Decepticons. “It’s a personal hobby; I watched the movie and learnt the models online, so I wanted to make it on my own,” Wang Shizun, one of the farmers, told AFP by phone on Thursday from Zhangqiu in Shandong province. “We’ve installed lights in their eyes, and some of their arms and legs can move,” he said. He and his partner oversee a staff of 11 farmers, reports said, and OFweek, a website covering China’s high-tech industry, said the models fetch from 10,000 to 100,000 yuan ($1,600 to $16,000) apiece. The tallest of creations are 12 metres high, but flight and the ability to convert themselves back into cars remain elusive. The group have also made other models which seem to take inspiration from various movies and characters, including Alien, Predator, and Star Wars’ C-3PO. With some the makers have exercised more creative licence, adding their own designs or traditional Chinese elements such as a mask.